Introduction: As a consequence of a sessile lifestyle, plants often have to face a number of life threatening abiotic and biotic stresses. Plants counteract the stresses through morphological and physiological adaptations, which are imparted through flexible and well-coordinated network of signalling and effector molecules, where phytohormones play important role. Hormone synthesis, signal transduction, perception and cross-talks create a complex network. Omics approaches, which include transcriptomics, genomics, proteomics and metabolomics, have opened new paths to understand such complex networks. 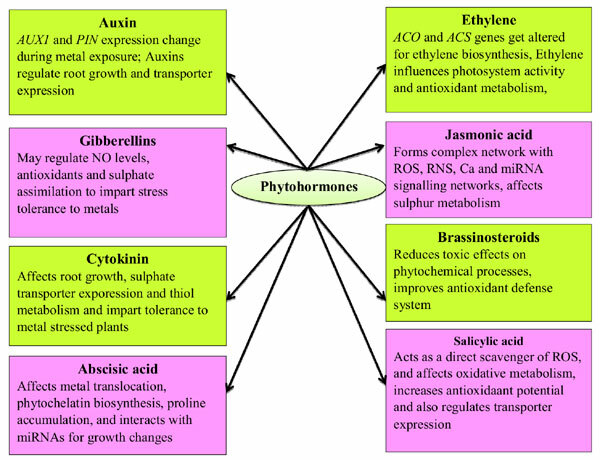 Objective: This review concentrates on the importance of phytohormones and enzymatic expressions under metal stressed conditions. Conclusion: This review sheds light on gene expressions involved in plant adaptive and defence responses during metal stress. It gives an insight of genomic approaches leading to identification and functional annotation of genes involved in phytohormone signal transduction and perception. Moreover, it also emphasizes on perception, signalling and cross-talks among various phytohormones and other signalling components viz., Reactive Oxygen Species (ROS) and Reactive Nitrogen Species (RNS). Keywords: ABA, Auxins, Comparative genomics, Jasmonates, NADPH oxidase, Phytochelatins, Strigalactones. Keywords:ABA, Auxins, Comparative genomics, Jasmonates, NADPH oxidase, Phytochelatins, Strigalactones. Abstract:Introduction: As a consequence of a sessile lifestyle, plants often have to face a number of life threatening abiotic and biotic stresses. Plants counteract the stresses through morphological and physiological adaptations, which are imparted through flexible and well-coordinated network of signalling and effector molecules, where phytohormones play important role. Hormone synthesis, signal transduction, perception and cross-talks create a complex network. Omics approaches, which include transcriptomics, genomics, proteomics and metabolomics, have opened new paths to understand such complex networks.